Thursday, March 29th the U.S. Vets Initiative, Coachella Valley Housing Authority, and local government officials celebrated the March Veteran’s Village grand opening in Riverside, California. 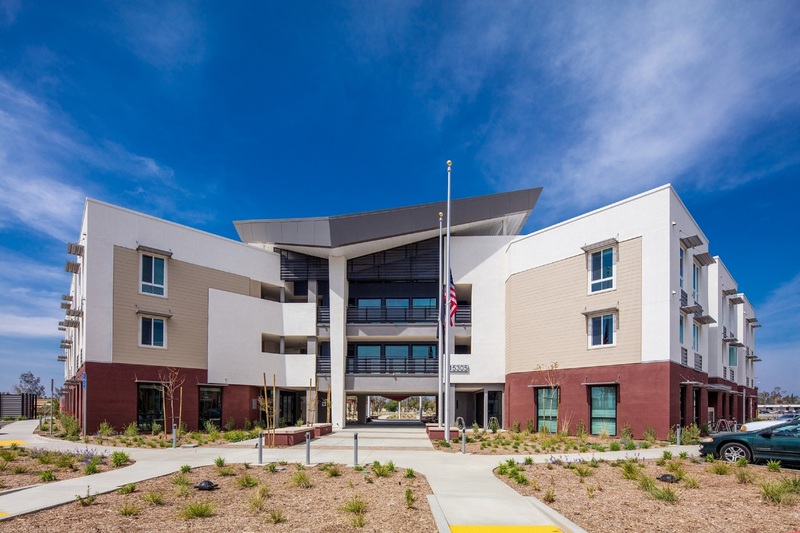 This supportive housing facility designed by Danielian Associates Architecture + Planning and built by Brown Construction features bold, iconic architecture and a service-rich environment to house and care for our military veterans. The complex was planned and designed to create a walkable, campus-like setting that will provide a nurturing, rehabilitative environment. By providing housing, meals, and career training counseling for veterans, the goal for this project is to help the transition back into civilian life as smooth as possible. The housing component is comprised of three different programs: the Veterans in Progress program provides short-term dorm style housing with on-site counseling for high-risk veterans; the efficiency program provides single room occupancy units for veterans who are being re-trained for the job market or for those who have found work but need low cost housing; and the third component accommodates the families of veterans who are also in need of low cost housing. The community has been designed to be LEED Certified.